As the exclusive distributor of Hubtex sideloaders in North America, Design Storage & Handling, Inc. offers a dedicated team of sideloader experts to tailor any model of the world’s largest and As the exclusive distributor of Hubtex sideloaders in North America, Design Storage & Handling, most complete range of long load handling equipment to your specific application. Inc. offers a dedicated team of sideloader experts to tailor any model of the world’s largest and most complete range of longteam load is handling to yourlargest specificsideloader application.replacement Our nationwide support backedequipment by the single parts inventory not just in North America, but anywhere in the world! Our nationwide support team is backed by the single largest sideloader replacement parts inventory not just in North America, but anywhere in the world! safety made simple push-through prevention affordable compliance • easy installation • no tools needed REQUEST A FREE SAMPLE! ADVERTISING CALL 877.638.6190 Email: dmillius@MHWmag.com • acoffman@MHWmag.com Material Handling Wholesaler reserves the right to reject or cancel any advertising for any reason, at any time. Advertisements that simulate Material Handling Wholesaler editorial matter in appearance or style or that are not immediately identifiable as advertisements are not acceptable. Brands are built using direct mail, email blasts, digital advertising, social media and blogs, among other platforms. “Materials must include taglines and company content that helps influence consumers’ perception of your brand and to create the emotional connection to it. The messages must be truthful or the opposite effect will occur, creating a negative brand experience,” Lelewicz said. “When it comes to shaping our brand experience, we’re currently focusing on educating the market through informative blog topics, handout materials on new concepts within the industry as well case studies. We look to position our company as a leader in our field through best-in-class content. By educating potential customers, they associate your brand with being the go-to expert, so when the time comes to purchase material handling products, we hope to be on the top of their mind,” she said. An online presence means companies need to protect their brand on the web. “Nowadays it’s equally important to monitor your online reputation to be aware of what others are saying about your company. This includes consumer and employee online mentions. I suggest using ‘Google Alerts’ to keep tabs on what is being said about your company. Once set up, Google will send automated emails with lists of links relating to any keyword of your choice. I have alerts set up for our company name as well as our competitors names to keep in the loop of what is being said online,” Lelewicz said. Mary Glindinning is a freelance writer who has worked at daily and weekly newspapers for more than 20 years. She lives in rural Shullsburg, Wis. E-mail editorial@mhwmag.com to contact Mary. ÂŠ 2 01ÂŠ 3 2016 H a m Hamilton i l to n C a ste r & &MMFG. FG . Co. Caster Co. Handle your brand with care: 10 ways to get out of a rut Your brand is in a rut. A stuck-on-the-bottom and not-moving-upanytime-soon rut. Maybe your customers no longer want you as a friend; or maybe they’ve simply fallen for something shinier and newer. How do brands end up in this position anyway? Easily, if they’re complacent, over-confident, shortsighted or blindsided. Very rarely does a brand that relies solely on price in a defensive strategy succeed. It can be a trip-and-fall from losing touch with the customer, like making errors or penning policies that cost the channel money. Regardless, it’s fix or fail. Whatever the reason, it doesn’t have to stay this way. Even a first step in the right direction can help change a brand’s entire course, and help you win back the affection and trust of customers. Here’s a checklist of 10 things you should think about when you need to get your brand back on track: 1. Assess your brand’s strength. Even if it’s troubled, it may have more equity than you know, and that can provide a firm foundation for change. 2. Face the facts with brutal honesty. Assess the situation with all the emotion of an IRS agent. Err to the downside and develop the situational analysis accordingly. 3. Communicate with key stakeholders. Without imperiling the company/brand, address the situation with key stakeholders, which could also be customers, even if you don’t have answers to all the questions or solutions to all the problems, don’t hide away. Commit to working on the problem(s) and follow through. 4. Show customers you care. Demonstrate understanding and empathy. Show that you have calculated the impact on them and that you’re working to fix it. 5. Be honest, clear and consistent. If you need to change direction, then explain why clearly and stick to the course. 6. Find the right solution. What do you need to do to alleviate the pressure and elevate the brand’s position? Be cautious of starry eyes; do only what you can achieve realistically. Apply the same brutal honesty to your solution as you did for understanding why you got there in the first place. 7. Stay committed. Announce the solution and implementation plan only when you are absolutely certain you can deliver on the promises and when you are assured a commitment from leaders, the board of directors, etc. 8. Execute the plan as flawlessly as possible. If something gets messed up, own it and fix it. Never preach perfection. 9. In developing your solution plan, make sure you include metrics. Whether it’s measuring the number of complaints or compliments, distributor conversions, unique website visits, or NPS, attach relevant KPIs and report on them regularly to all stakeholders. 10. Get leadership buy-in. If leaders aren’t in, you’re out. Business and brand leadership must not only be on board, they must also be vocal supporters and active participants. When the shades are down in the corner office, employees and customers become skeptics. Clearly, this isn’t an instant springboard out of the pits, but at the very least, it’s a thought-starter to help move a troubled brand back in the right direction. About the author John Favalo is a managing partner at integrated marketing firm Eric Mower + Associates and member of the agency’s specialty marketing group EMA Buildings & Construction. THIS CUSTOMER WANTS IT FASTER. THAT CUSTOMER WANTS IT CHEAPER. YOU NEED THE ANSWER. SOLVE FOR X. What does your supply chain need? Is it automation? A new process? A breakthrough technology to enhance efficiency? Find your “X” at ProMat, the manufacturing and supply chain industry’s largest trade event. At ProMat you’ll see the latest innovations from 850+ solution providers. You can also network with your peers and learn from industry thought leaders in keynotes and over 100 seminar sessions. ProMat is the place to discover new ideas, equipment and technologies that will shape future supply chains. Come find what’s next. Come solve for X. Only at ProMat 2017. Aftermarket the time is to simply open a warranty job. This is customary and expected, as every piece of new equipment normally comes with some form of OEM warranty. It’s interesting however how the understanding of warranty is seldom taught to, and therefore seldom embraced by, the sales staff. Most manufacturers, start the explanation of their warranty with the same word: LIMITED. Even the sales guys know that there are things that are not covered, but they do not really seem interested in defining that list for the customer. One of the most effective ways to get salesmen to participate in the process of regulating unrecoverable warranty expenses is to give them monetary motivation. In our dealership, all customer work is billed to either a retail customer work order, an OEM warranty work order, or a sales warranty work order. If we are providing services that are connected with the delivery of a recent piece of equipment, any non-OEM warranty work is either billed to the customer, or to the sales department. This puts the cost burden on the department that many times is so quick to issue free passes. It’s amazing how quickly salesmen get off the free lunch bus when the expenses connected with post delivery services starts affecting their commission statement. This is not to say that we don’t assess these expenses after the fact, and move some of the costs to customer policy adjustment. The exercise however forces the stakeholders to educate themselves about the process, and to commit resources only after considering the possible costs. It also establishes a default accountability mechanism that accounts for the costs today, and (perhaps) reallocates these expenses later. Method two – manufacturer’s warranty acknowledgement One of the weaknesses in our customer engagement process is that as an industry we do a poor job of positioning ourselves for the maximum benefit of the dealership on the very day a piece of equipment is being delivered. With each unit put into service, there will be a trail of money that follows. We must put ourselves in the best position to retain these opportunities. Not only is there money to be made, but there is also a unique opportunity to prevent losses, by eliminating unnecessary expenses. There is a cultural paradigm in this country that applies to this process. “If I don’t TELL you, then you don’t have to pay” It’s the unwritten rule of the American marketplace. Large ticket items by their nature carry a set of customer expectations that need to be managed in order to be truly successful. Especially in the days following delivery, anything that may go wrong is automatically assumed as being warrantable. If the rules and policies concerning warranty are not addressed specifically with a customer, you can rest assured that the customer will use the “You didn’t tell me” gambit to avoid paying any of these costs. We can mitigate the damage to the dealership in covering non-warrantable repairs by simply ensuring that the warranty is not only explained in detail, but that the customer signs an acknowledgement stating that the warranty terms and conditions were clarified and understood. Once our dealership made this acknowledgement part of our seven step delivery process, the number of customer issues after delivery reduced dramatically. Let Us Work For You! WE DON’T SELL OUR SOLUTION TO YOUR PROBLEM. IT’S OUR PROBLEM TO DEVELOP YOUR SOLUTION. Aftermarket Method three – administrative training Many of the issues that put holes in the boat start in service administration. Dispatchers, expeditor’s, and schedulers, are the first line of defense when it comes to managing expectations. Many of these employees are classified as clerical, but in many ways the image of your company, and its reputation for customer service lies in the hands of these very important employees. Being a dispatcher can be a thankless job. Nobody ever calls to say thank you. Every phone call presents another problem. Needs must be assessed and prioritized. The customer’s urgency is always palpable and at times is accompanied by hostility or desperation. In the heat of the moment, if we are not careful, we many times end up allowing the emotional distress of the moment to distract us from our SOP, and this is where training and solid policy can prevent the dealership from experiencing a financial loss. Are your dispatchers trained? • Do they collect the appropriate data, every time the same way? • Are they instructed on how to prioritize “machine down” and respond properly to customer urgency? • Do they understand the warranty on all of the equipment you sell? • Do they have scripted responses to common customer questions and complaints? •D  o you have policies in place and are dispatchers trained on ascertaining customer credit standing, and applying appropriate customer labor rates? • Do they know and do they properly inform the customer in regard to overtime charges, travel time and other fees? Once again, it’s much more difficult, if not impossible, to manage customer expectations on the back side of the issue. Giving your administration crew the information and tools they need to engage this process confidently, and in advance, serves to prevent those pesky leaks from ever forming in your boat. There will always be occasions where departments must work together in order to satisfy the needs of the customer. There are plenty of opportunities however to make better, and more intentional decisions. This can be done by employing adequate education and training. Your people deserve to have the tools and policies in place to assertively clarify their positions. Your efforts to establish interdepartmental accountability inside the dealership will pay hefty dividends, and keep the inside of that boat nice and dry. This is not a simple, or painless process…..but accountability seldom is. So, patch the holes in your boat and keep on sailing! Dave Baiocchi is the president of Resonant Dealer Services LLC. He has spent 33 years in the equipment business as a sales manager, aftermarket director and dealer principal. Dave now consults with dealerships nationwide to establish and enhance best practices, especially in the area of aftermarket development and performance. E-mail editorial@mhwmag.com to contact Dave. • Saves valuable floor space for other use. • Supports thousands of pounds. • Move more material with fewer moves. • Stacks 4-5 high. • Nest or knock down when empty. • Custom designs are our specialty. Stock program available on some sizes & designs. Bottom Line presentation at the October event. TheExchange, is a online, private dealer-only wholesale marketplace for the global trade of heavy equipment. After reviewing the website I believe this program can be successful and help dealer members find or move used units faster. The second member of this group is called EquipmentShare, which is a peer-to-peer construction equipment marketplace for companies looking to borrow (rent) affordable equipment while allowing other equipment owners to rent out their idle or dormant units. EquipmentShare takes care of logistics, including delivery, maintenance and insurance. Very interesting indeed. Again, I suggest you review the website to see how they plan to make this a win-win situation. One last winner for this month which I hope you will review when you get a chance. A number of dealers (all sizes) are working with a company called Winsby. It is really a costeffective program that delivers meaningful results that will produce increased recognition in your market, more interest from current and potential customers, growth in new customers, a higher retention rate and more loyalty towards your company. I know the companies that are using them and also know they wouldn’t be doing so if it wasn’t working. Garry Bartecki is a CPA MBA with GB Financial Services LLC. E-mail editorial@mhwmag.com to contact Garry. A detailed answer describing specific decisions and actions that led to a positive result would show, to an extent, that the applicant has learned how to compensate for her shortcomings. However, a vague response may indicate the applicant is taking personal credit for a team effort or that she depends too heavily on external guidance to manage projects. To hiring managers who want to make best use of the behavioral interviewing method, Dr. McLellan suggests, “Start by preparing a set of questions focused on the key competency areas that drive success in your organization, and then identify behavioral anchors you can use to measure the applicant’s relative skill or experience.” For example, if the applicant does not demonstrate—through her responses to behavior-based questions—adequate skill in a key competency area, the hiring manager may record a 1. A developing skill might receive a 2 and proficiency would receive a 3. Dr. McLellan also recommends interviewing in pairs, with one interviewer asking questions and the other recording 1, 2, or 3 as appropriate. This enables the first interviewer to engage with the applicant and avoid becoming distracted by the scoring process. The ultimate benefit is increased objectivity and a relatively simple yet useful method of scoring each applicant. Just make sure to ask the same questions of each candidate interviewing for a given position. The combination of pre-employment assessment results and behavioral interviewing is like the one-two punch a boxer uses to KO an opponent. Except that, in this case, everyone wins: You’ll bring in the person best suited for the job, and she’ll be motivated to perform well in a role that plays to her strengths. About Caliper - To find out more about how Caliper can help you identify and develop people who can lead your organization to peak performance, please visit us at www. calipercorp.com or call us at 609-524-1200. Email editorial@mhwmag.com to contact Caliper. Continental develops a CLEAN Tire Technology while manufacturing millions of passenger and truck tires. CLEAN Tire Technology is the “Secret” to Continental’s press-on-band and resilient tires outperforming the competition — in many cases lasting more than twice as long as our competitors brands or longer. Continental blends Natural Rubber and Silica together at the molecular level creating a New, Stronger Compound. “instructional statements,” I have suggested their use for years. It’s easier for someone to comment on something, than to create it themselves. For example, “Tell me about how you handle your downtime issues…” “Describe the process for…” “Tell me about the last time you had a situation where…” 3. “What’s your plan today?” Or, “What’s your day looking like?” This hints that you care, and that you want to help. And it sets up the next two questions. We could use, ‘“What’s your plan for the rest of the month regarding…?” “What does your fourth quarter look like as it relates to…?” 4. “How can I help make this a good day for you?” Burkes suggests that if you really want to know about a person’s well-being, then you must be willing to help. These are more general questions, and of course context plays a key role in their effectiveness. Examples we could use are, “What can we do as a supplier to help?” “How can I help you reach those goals?” “What could we provide you to accomplish that?” 5. “What are you hoping for?” “What are you praying for?” The author says that you are accomplishing two things here: You are getting them to examine their greatest needs, and you are entering into a spiritual covenant to help them attain what they want. While in a business setting, we probably would not ask about their praying, we can adapt it to get similar results. “What are you hoping most for with this project?” “What do you want the most regarding the outcome?” “What, ultimately do you hope to happen as a result?” These are some great “pick up” questions that can get your prospect/customer to really reveal their innermost needs, pains, problems and desires, therefore helping you to help them. Art Sobczak helps sales pros prospect, sell and service accounts more effectively by using conversationally, non-salzes messaging, and without “rejection.” Get a free ebook of 501 telephone sales tips at businessbyphone.com/501-tips-ebook. Email editorial @mhwmag.com to contact Art. Rite-Hite celebrates 50 years It all began as a start-up and after a half century of operation, RiteHite has grown and transformed into a company with a global presence in loading dock equipment and other industrial products. “Where we were once known as the ‘loading dock and door company’, today we are a solution provider at the loading dock and inside the plant,” wrote Sara Everts, corporate marketing and communications manager for Rite-Hite, in an email to Material Handling Wholesaler. “We want to make sure our customers know the breadth of what we can provide,” she said, noting that Rite-Hite strives to provide “high quality, innovative products and services” designed to improve safety, security and productivity. Rite-Hite bills itself as a world leader in the manufacture, sale and service of loading dock equipment, industrial doors, safety barriers, HVLS fans, industrial curtain walls and more, according to the website. The company is headquartered in Milwaukee and marked its 50th anniversary in 2015. Rite-Hite was founded by Art White, and is now owned and operated by his son, Mike White. While Art White managed the challenges of launching a new business, his son has overseen the expansion of the operation, Everts said. “Through innovation, acquisitions and a lot of hard work from devoted employees, Rite Hite is now a worldwide force at the loading dock and inside the plant,” she wrote. Also in 2015, Rite-Hite’s DOK-LOK® trailer restraint turned 35. It protects against several types of trailer separation and after its 1980 launch quickly became an industry standard, according to Rite-Hite’s site. Other innovations from the company include: SAFE-T-LIP® hydraulic dock leveler; the Global Wheel-Lok™ wheel restraint; the FasTrax® high speed door; the Eclipse™ loading dock seal; the Revolution HVLS Fan; and the Dok-Guardian. The business serves customers around the world and has representatives in the form of Rite-Hite-owned businesses and independent distributors in many countries, according to Everts. “Our distribution model centers on providing a local rep that is trained by RiteHite to understand our culture as well as our products, and these reps are trained to sell, install and service Rite-Hite products,” she said. The business has almost 2,000 employees and partners with more than 30 representative organizations in 100 locations, the web site reported. Rite-Hite offers consultations, education and demonstrations to each individual customer, according to Everts. In the US, local contacts are stationed in every state either as independent distributors or through Arbon Equipment, one of RiteHite’s companies. One of the challenges for Rite-Hite going forward is helping the customers who increasingly self-educate through the internet and other sources make informed purchasing decisions. This can be achieved through continuing education and consultation efforts, Everts wrote. “Once people understand the risks and benefits related to the purchase of a certain product, then they make the best decisions,” she said. In the future, Rite-Hite will continue to strive to connect with customers at the right time so long-term partnerships can be formed. “Our big goal is to be viewed as a premier supplier of high quality product and service solutions and to maintain a reputation for integrity in all that we do,” Everts said. Eileen Schmidt is a freelance writer and journalist based in the Greater Milwaukee area. She has written for print and online publications for the past 12 years. Email editorial@ mhwmag.com or visit eileenmozinskischmidt.wordpress.com to contact Eileen. The “What’s New” product and service guide has many new products and services to enhance your current offerings at your business. Advertisers! Don’t miss out on new sales-advertise in the 2016 What’s New Products & Service Guide Call Alva or Dean at 877.638.6190 now! Ad Deadline is Monday, September 26. THIS IS THE NEW NORMAL Proven Solutions That Work! The NEW NORMAL Trucks Are On The Road Now! Andrea Neisen, Project Coordinator — AK Material Handling Systems Andrea’s background in management and order fulfillment allows her to excel as Project Coordinator at AK. Andrea collaborates with The Design Group at AK Material Handling System to make sure the execution phase meets the unique demands of your business operations. Whether it’s making sure an order ships on time or coordinating your multiphase installation, Andrea ensures the timeline is adhered to with a seamless delivery. Brenda Harrison, Senior Project Account Specialist — AK Material Handling Systems Brenda’s background in management, project coordination, logistics, communications and organization allows her to excel in her role at AKMHS as a Senior Project Account Specialist. With 27 years on the job experience, specializing in the grocery industry and a key member of The Design Group, Brenda has displayed her passion and enthusiasm to work with her customers, vendors and team members to provide the highest degree of service and the best possible storage solutions in the industry. Rachel Ballard, Sales Support — Bluff Manufacturing Rachel is an organized, detail oriented, solutions-focused team player with 10 years of manufacturing experience. She is a highly valued contributor to our Sales Support team because she strives to exceed the expectations of our distribution network. Her thorough knowledge of Bluff product coupled with clear understanding of applications makes her a ‘goto’ for many of our distributors. Daisy Ramirez, Sales Support — Bluff Manufacturing A rising star on our Sales Support team, Daisy Ramirez, came to us fresh out of college and is making a significant contribution by working with our Spanish speaking distribution network. Her can-do energy and enthusiasm for helping customers coupled with her speed and accuracy in providing the correct product for the application has earned her the respect of many long time material handling salesmen. Sheila Trapp, Sales Support — Bluff Manufacturing Sheila is a tenacious problem solver with strong analytical skills who during her 4 years with Bluff has become a master user of our ERP system. Whether she is helping a colleague or a distribution partner, Sheila seeks to create efficient processes to streamline work and get the best result possible the first time out. With experience in distribution and manufacturing Sheila has worn many hats and understands the challenges our distributors face. Cindy Holybee, Steel Structure Sales/project management — Bluff Manufacturing Known throughout the industry for her technical aptitude, excellent project management and follow through Cindy has been partnering with Bluff’s distribution network for 16 years. Mastery of Bluff’s entire product line coupled with southern charm puts Cindy in high demand for webinars and joint sales calls. Cindy takes great pride in partnering with our channel partners for exemplary results. Teresa Mozisek, Steel Structure Sales/project management — Bluff Manufacturing A nine year veteran of Bluff Manufacturing, Teresa was a lead in the Sales Support team before joining the Steel Structures sales and project management team. Strong project management and organizational skills coupled with technical aptitude and an infectious positive cando attitude makes her a key player both inside and outside our organization. Regina Chapman, Inventory/ Purchasing — Bluff Manufacturing Speed and accuracy are qualities that Bluff is known for and Regina embodies these traits. Having worked on both sides of the house, Regina is familiar with sales transactions, our finished product, parts and materials. She has made a significant contribution to inventory and purchasing by streamlining processes. Heidi Richwine, Sales Administration — FSIP Heidi joined FSIP in 1999 as a Customer Service Representative. Soon after, she took the role of Customer Service Manager, where she ensured that FSIP provided the best customer experience. In 2014, Heidi joined FSIP’s Sales Team, where she is able to focus her concentration on individual customer relationship building. While FSIP’s product offerings have expanded throughout the years, so has Heidi’s knowledge of the material handling industry, as well as her ability to assist customers with all of their business needs. Amanda Nieb, Marketing Specialist — FSIP Amanda joined Flight Systems Industrial Products in 2009. As Marketing Specialist, Amanda is responsible for planning, developing and implementing all FSIP advertising and marketing campaigns. Her focus is to promote FSIP’s high standard of quality products and services, while ensuring brand recognition throughout the industry and attracting new customers for continued business growth. Pam Jones, Director of Sales & Marketing — FSIP FSIP provides new and remanufactured electronic products, found on electric and gas powered vehicles. They also provide manufacturing services, including OEM legacy type products and offer new design work for electric drive applications. Pam joined the FSIP team in 2007 and has focused her attention on FSIP’s market share growth, through marketing and product development programs. She has concentrated on cultivating OEM affiliations and building strong customer relationships. She is proud to have many “Women to Salute” on her FSIP team! Michelle Zerphey, Sales Manager — FSIP Michelle became part of FSIP’s team in early 2016. She brings with her 10 years of experience in retail service sales, as well as expertise in client relationship building and account management. Michelle is a customer oriented problem solver with an ability to adapt to new situations quickly. She leads FSIP’s talented Sales Team, and works closely with FSIP’s distributors and international customers. MHEDA recently started a Women in Industry initiative to connect women working in material handling. “The women involved with MHEDA are very enthusiastic about this initiative and anxious to get involved. They are all very engaged and eager to connect with other women in the material handling industry and have recently starting a mentoring program to foster growth among women who are new to this industry. This has been very positively received,” said Rebecca Hein, networking coordinator and meeting planner for MHEDA. It is estimated that men hold 80 to 85 percent of executive and senior level positions in material handling. Some of the things women want to discuss are how to bridge communication style differences between men and women, help men understand why they want to be part of material handling and how to change the industry culture. The Women in Industry Initiative has a tele-networking program, holds a breakfast at the MHEDA annual convention in May, and next fall, it will host its first conference, with the date to be announced.. About the author Mary Glindinning is a freelance writer who has worked at daily and weekly newspapers for more than 20 years. She lives in rural Shullsburg, Wis. E-mail editorial@mhwmag.com to contact Mary. Liz Nickey, Customer Service Supervisor — FSIP Liz started her career at FSIP in 2010. As Customer Service Supervisor, her job is to ensure that FSIP’s Customer Service team is knowledgeable and efficient, to best serve this constantly changing and challenging industry. Her team is a very diverse team, with everyone bringing a different trait to help better serve FSIP’s customers. The Customer Service team strives to give customers the best experience every day! Michelle Butler, Sales Specialist — FSIP Michelle has been with FSIP since 2008, and was promoted to Sales Specialist for the North East/West Territory in 2014. Michelle works closely with FSIP’s customer service department and servicenter to ensure a good experience for customers. She finds it very satisfying to educate new and existing customers on FSIP’s products and services, which in turn helps them grow their businesses. She has also had the opportunity to work on FSIP’s Xtender team, gaining more knowledge about the Xtender Battery Restoration System. Jodi Miller, Customer Service Specialist — FSIP Jodi became part of FSIP’s Customer Service Team in 2011, and later transferred to the sales team to oversee General Electric Legacy products and assist customers. She has a wide variety of knowledge in products for the Material Handling Industry, and now works with FSIP’s Manufacturing Services and General Electronic Repair Program. Jodi enjoys the variety of experiences that each day brings at FSIP. Kathy Fatherree, Accounting Clerk — FSIP Kathy began her career with FSIP as an Accounting Clerk in 1999. Her many responsibilities include handling the payroll for 120 employees, cash applications, and making sure that all of FSIP’s bills have been paid on time. Kathy also helps with FSIP’s United Way Campaign, and is involved in planning many company activities such as the annual employee picnic and holiday festivities. Heather Schalles, Customer Care Manager — FSIP Morgan Kurtz, Business Development Manager — FSIP Morgan has been with FSIP since 2013 and has held many roles as part of the sales, customer service and product development teams. In her current role as Business Development Manager, she manages all aspects of the products that FSIP offers. She works closely with the engineering department on new product development for both new and remanufactured products. Morgan is also responsible for creating and delivering employee and customer product training. Heather joined FSIP in 2015. As Customer Care Manager, she leads the customer service, quality administration and technical support teams. Heather has been learning the business and getting to know FSIP’s customers, focusing on their needs and expectations. At FSIP, it is all about the customer and providing them with an exceptional experience. The Customer Care Team is passionate about customers and the service they provide. Verizon to acquire Fleetmatics Verizon Communications Inc. and Fleetmatics Group PLC announced they have entered into a definitive agreement under which Verizon will acquire Fleetmatics, a global provider of fleet and mobile workforce management solutions, for $60.00 per share in cash – representing a value of approximately $2.4 billion. “Fleetmatics developed a wide-range of compelling SaaS-based products and solutions for smalland medium-sized businesses,” said Andrés Irlando, CEO of Verizon Telematics. “The powerful combination of products and services, software platforms, robust customer bases, domain expertise and experience, and talented and passionate teams among Fleetmatics, the recently-acquired Telogis, and Verizon Telematics will position the combined companies to become a leading provider of fleet and mobile workforce management solutions globally,” Irlando added. Keeps seat dry! Keeps seat dry! Avoid OSHA ﬁnes! Avoid OSHA ﬁnes! DeDee Baugher, Grindstaff Engines My husband and I live just outside of Kansas City. We have a son and daughter who have 8 children between them. We also have 3 great grandchildren. They all live close by. Family is very important to me. We will be anxiously watching the Chiefs this year and hope they make it to the Super Bowl!! I started my career working office and administrative positions and have been in the material handling Business since 1999 with Grindstaff Engines. Prior to that I had worked 15 years in a large car dealership. I have come to find out that several of our customers also started in the automotive field. Most of our Customers are very friendly and I really enjoy talking with them. Jessica Mazzei, Manager — Industrial Decals Jessica Mazzei is the Manager at Industrial Decals & Marketing Corp. They specialize in custom fleet markings and decals for industrial equipment as well as promotional items. Industrial Decals has been serving the material handling industry for over 16 years. Jessica started out in production and is now overseeing operations. She has also made sure that the company stays community minded by keeping the company actively involved in local charities & church ministries. Recently celebrating 15 years of marriage, Jessica is also a proud mother, and she is a diehard Rangers hockey fan, enjoys fitness, as well as cooking and has even had some of her cooking featured on national TV. Beth Vrba, Vice President of Life Cycle Services – Americas — Kardex Remstar Inc. Beth was recently promoted to her new role as VP of Life Cycle Services (LCS). With 11 years of experience at Kardex Remstar, she is no stranger to the overall operation. Beth oversees several different teams responsible for being the technical equipment experts, hardware and software support, customer service support as well as manufacturing, shipping and spare parts. Beth is very active in her new role, and we congratulate her on her accomplishments at Kardex Remstar. Dannelle Dahlhauser, Director of Marketing & Sales Support — MH Equipment Dannelle joined MH in 2004. She manages a team whose primary responsibility is generating awareness across the MH market as well as a team responsible for consistent sales processes and procedures. “During my tenure at MH, I have seen tremendous growth in our organization – not only in a business sense, but with our culture. At MH, you can be assured that People Matter!” Dannelle is the current group leader for the MHEDA group “Women in Industry III”. Alva Coffman, Account Executive — Material Handling Wholesaler Alva has been with Specialty Publications for 14 years with seven of those years as an account executive for Material Handling Wholesaler. Alva enjoys working with clients to help them reach the perfect audience for their products. Alva has been a lifelong Cubs fan and is eagerly awaiting the playoffs. This is the year! Go Cubs! Kathy Regan, Editor — Material Handling Wholesaler I have been the editor of Material Handling Wholesaler for four years. I love working with our authors picking topics that provide solutions to current issues in the industry and contribute to the success of our audience. My favorite issue is October when we get to spotlight key successful women in the industry. Maggie Vetsch, Accounting/ Office Assistant — Material Handling Wholesaler As the accountant and general office assistant, I have quite the “handle” on Material Handling Wholesaler. Working closely with the publishing and sales team, I ensure that all of our Material Handling accounts are receiving accurate and timely information behind the scenes of our monthly Magazine and various online products. It has been a wonderful learning experience thus far and has provided me with an opportunity to gain a lot of knowledge in the Material Handling Industry. Kim Deffenbaugh — TVH Kim Deffenbaugh is the Operations Administrative Lead for TVH’s Facility Operations Department in Olathe, KS. Kim has been with TVH for 7 years and is responsible for all of the administrative duties and special projects for the Operations Department managers and staff. She enjoys being involved in TVHCares, TVH’s volunteer program, and getting to work with customers. Jennifer White — TVH Jennifer White has been with TVH for 20 years and is currently the Claims Department Manager. She expertly manages a team of people who work closely with TVH’s customers and help guide them through the return process. She and her staff enjoy being able to build close personal relationships with the customers. Jennifer is also actively involved in helping TVH create a company culture that is second-to-none. Shalaigh Koehl — TVH Shalaigh Koehl is the Inside Sales Manager for Domestic Sales at TVH. Throughout her career she has placed a strong focus on putting people first and she brings that dedication to TVH. Although new to the industry, she is enjoying getting to know the customers and learning more about the forklift industry. She also enjoys working with her team who show their passion for the industry at work everyday. Shannon Jumet — TVH Shannon Jumet is the Primary Picking Lead at TVH and is responsible for the staff that pulls parts for customers as well as the 12 TVH locations in the Americas. She enjoys the family atmosphere at TVH and working with the staff. In 2014, Shannon was the co-winner of the TVHOne Employee of the Year award for her efforts in revising the way orders are picked. The new processes helped to increase fulfillment speed and reduce overtime. Tuesday West — TVH Tuesday West started as a Second Shift Checker and Forklift Driver and through her hard work and determination has moved up to Decal Production Assistant at TVH. She has participated in the TVH Mentor Program, which has helped her to establish goals and grow within the company. Tuesday enjoys every new experience that her job brings and looks forward to her future at TVH. Denise Freeman, Sales Support — NA Construction, Trelleborg I’m celebrating 18 years working in the Industrial Tire Industry. I’m currently very proud to be working with Trelleborg Wheel Systems. I have a bachelor’s degree in education, which has helped me with patience, trust, and organization to execute quick decisions. Today I have a new and very exciting role as inside sales support working to grow our National Account business and helping our dealers grow National business along with Trelleborg Wheel Systems. Talia Toffolo, Senior Planner — Trelleborg Talia joined Trelleborg in 2011. She works directly with suppliers to ensure proper stock levels in Trelleborg’s distribution centers throughout the US and Canada. She developed the first Planning Department manual, is a member of the Safety Committee, and enjoys having a first-hand view of the global supply chain and learning about the tire industry. Her favorite part of her job is the opportunity to travel and work with colleagues all over the world. Jennifer Giavasis, Director of Customer Service — Trelleborg I’m proud to be celebrating my 10th year with Trelleborg. My team supports every aspect of assisting customers and providing solutions for their issues. I have a Bachelor’s Degree in Business Administration and Associate’s Degree in Education. I have a background in IT Applications, Forecasting and Data Analysis and Project Management in full cycle supply chain. The material handling industry is constantly changing and evolving. I enjoy the challenges and opportunities I see every day! Bernadette Martel, Senior Business Analyst — Trelleborg Challenges! Adventure! Excitement! The life of an analyst has all of these things. My role in the finance department includes anatomizing data, inventory and costing analysis, budgeting/forecasting, and taking on new projects and process improvements. The finance team, and TWSA as a whole, are very innovative and growth opportunity centric which has made my 5 years here a fantastic journey. Linda Mitchell, Financial Controller — Industrial Tires, Trelleborg This year I celebrated my 20th year at Trelleborg Wheel Systems. I love the daily challenge in working with numbers; and with a strong finance team in place here, we’ve enjoyed many great accomplishments. My job is very fulfilling and always evolving, but when I’m not at work I love to put the numbers aside and spend time researching my family history. Janet Allgor, OEM Coordinator — Trelleborg I started working for Trelleborg in December 1994. I’ve had many roles with the company including sales, service, supply chain and distribution, and have enjoyed each one. In my current role I handle customer requests and support the sales team. I’ve spent a lot of time building relationships with our customers to form a great partnership. I am always looking for ways to improve to provide better service to our clients. The following Wholesaler readers won a 30th Anniversary limited edition chain wear gauge from FB Chain. Rick Symons - CSI Material Handling, Inc. Johnny Lessing - R&J Material Handling, Inc. Don Haas - Atlantic Forklift Services John Papie - PASCO Industrial Equipment Chris Wilson - Sunrise Forklift Inc. John Myrick - Gamron Inc. Christopher Schmidt - Handling Systems Inc. Happy Anniversary to Peter and the entire FB Chain family from all of us at Wholesaler! Ana Garcia, Customer Service Supervisor — West, Trelleborg Ana is going on 16 years serving the Material Handling Industry. She manages Trelleborg’s west coast distribution center and assists customers in the aftermarket with their tire replacement needs on a day to day basis. Her excellent service to OE customers has contributed to Trelleborg earning classification as a Preferred Supplier. Here are some highlights that might surprise you if you haven’t seen them before: • Women receive 60% of undergraduate degrees and 60% of graduate degrees and 44% of master’s degrees in business and management. • In 1965, just 1.2% of graduates from the class of 1965 at Harvard Business School were women. In 2017, that number will reach 41%. • 4.6% of S&P 500 companies have women CEOs. • The most women CEOs can be found in the professional, technical, and scientific services sector (15.4%) followed by the real estate and rental leasing sector (9.5%). Jackie Marchisin, Pallet Rack Specialist — Wholesale Pallet Rack Products As a Pallet Rack Specialist for WPRP, I am excited to work with our distributors to help them provide optimal solutions to their customers. Our resources allow us to choose from different quick ship locations. Being involved in helping open our newest PA Quick Ship program and helping to support and grow our East Coast customer base has been very rewarding. This makes it easy to ensure our customers have a positive buying experience. And this in turn makes me proud to be a part of the WPRP Team! Linda Anlauf, Pallet Rack Specialist — Wholesale Pallet Rack Products Being a part of the Material Handling industry is exciting and provides so many opportunities. I am passionate about working with our distributors, educating through our “Would You Like Fries withThat?” video series and participating in MHEDA groups such as the Pacesetters networking group and Women in Industry. The part of the industry I’m most passionate about is networking and meeting other Material Handling professionals at trade shows, conferences and social media platforms. How educating your buyers to make more informed purchasing decisions results in more business In today’s digital landscape, prospects looking to make a purchase are inundated with choices. With the availability of options within the click of a button, buyers want to be in the know to make the best possible purchase. The same is true for the manufacturing industry. Not having a digital presence is probably the worst mistake a company can make, however, simply existing on the web doesn’t cut it either. In a crowded digital space full of options, you must set your brand apart. How? Empower your prospects by educating them. Educating your prospects means you’re creating content of value to them. Beyond selling your products, you’re helping them resolve an issue or helping them learn. In short, you become a valuable resource for them. Craft content that addresses their pain points and relevant industry topics that matter to them. Share your expertise by writing blogs, creating webinars, writing helpful whitepapers, hosting lunch and learns, sending industry newsletters, and the list goes on and on. Don’t just tell them about the benefits of your products or services, instead teach them how to gain those benefits. Sharing your expertise not only starts the conversation between you and your prospects — it builds trust, positions your brand as a leader in your industry, and differentiates you from the rest of your competitors. Best of all it empowers your prospects. Your willingness to share information that actually helps your target audience will make you an indispensable and trusted industry go-to and not just another brand selling just another product or service. Come time they are looking to solve their problems using a product or service like yours, guess who they’ll turn to? You. So, how do you become the ultimate thought leader in your industry? It takes creativity and consistency. Find out who your buyer personas really are. Often times who you think are buying from may not always be the actual people making the purchase or doing the vetting or the hiring. Once you know your buyer personas, talk about what matters to them. Utilize your website and social media channels to spread your message. Make sure every content you create and share is a valuable one for them and not just another noise in the ever-noisy web. Last but certainly not the least, be consistent. One ebook or a few blog posts here and there will not catapult you to the top. No brand has ever become a thought leader over night. Keep at it and watch your brand rise to the top. About the author Adhere Creative’s Director of Marketing, Matt Lee, steers the ship of Adhere’s eclectic and talented marketing individuals. Matt’s indispensable inbound marketing wisdom enables the team to create and execute campaigns for businesses in the industrial, software, and business services industries that are truly ahead of the curve. Not to mention, his taste for craft beers and good music definitely amps up team spirit. 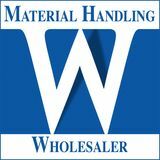 *Over 21,000 readers monthly receive Material Handling Wholesaler. Over 10,000 digital subscribers receive Wholesaler in their Inbox every fourth Thursday. Looking for current or past articles? Visit MHWmag.com. Looking for a new vendor? Go to the Source Directory. 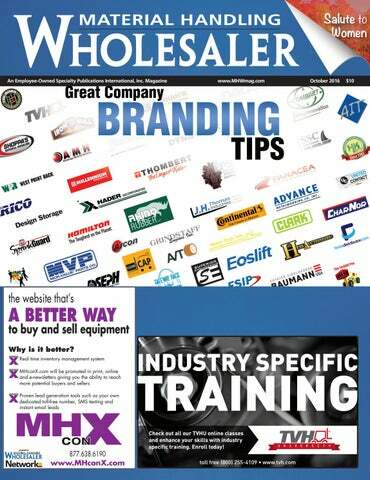 Every Tuesday morning the Wholesaler Weekly is emailed to over 10,000 subscribers with the latest industry news. The industries newest buy & sell equipment website: MHconX.com Try it for FREE by calling us today for a two month trial! New Single Phase Chargers 36-volt, 750 AH 48-volt, 600 AH other sizes available Original & Aftermarket Parts for Most Equip. Industrial Forklift Batteries and Chargers In Good Condition!! Call Us With Your Off-Lease Or Fleet Surplus Equipment. ■ More durable, easier to use, safer too. ■ Big selection, or custom to solve waste handling problems. We are an Amish-owned company. No website. Please call. Capacity: 3,000 lbs. - 180,000 lbs. Reducing Costs ... Increasing Space • Dramatically Reduces working aisle widths • Increases Storage by up to 50% • Works both inside & out • Does the work of both reach & counterbalance forklifts • Electric & LPG Powered Models • Lift capacities of up to 4,400 lbs. • Lift Height up to 49 ft.
Cantilever Racks • Structural Pallet Racks Portable Stacking Racks Specialty Transport & Storage Products West Point Rack is one of the fastest growing companies in the industry. Our customers recognize quality products, dependability of service and competitive pricing. LEDtronics CNP series of LED Canopy Lights have an extremely low profile, boasting a total height of only 2.75 inches. This sleek, slim design makes them perfect for any canopy application, such as gas stations, manufacturing, factory floors, warehouses, loading docks, parking & recreation areas, tunnels, canopies, entrances, walkways, underpasses, and many more. The fixtures only consume 60 to 130 watts, replacing HID lights of 200 up to 400 watts — an energy savings of up to 75%! The lumen output of this LED Canopy series ranges from 5,000 lm all the way up to 13,661 lm! They come in a clear or frosted flat lens in a beautiful pure white (5000K) color temperature. www.ledtronics. 15600 W Lincoln Ave, P.O. Box 510260 New Berlin, WI 53151-0260 We also carry pumps, power steering units & valves.